Sir Mick Jagger says Keith Richards' boast that he created the stage set for The Rolling Stones' 'A Bigger Bang' world tour is a lie. 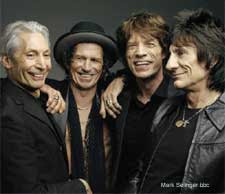 During a live webcast announcing the band's forthcoming European tour, Mick said: "The set is amazing. It's really quite beautiful. "Keith has been claiming he came up with most of the ideas for it. "That's a good one! I think he's been telling porky pies (British slang for lies)." The legendary rockers will play more than 20 shows across Europe, kicking off in Belgium in June and finishing in London on August 21. Click here to find out more! Mick, 63, said: "I never get tired. I'm really looking forward to it." In reference to Keith - who last year had to have brain surgery after falling out of a coconut tree in Fiji causing the band to cancel several dates - Mick joked: "I'll nail him to the nearest room. I don't think he'll be climbing any palm trees."